One of Canada's greatest marathoners with still a great passion for running answers a few questions before the upcoming Boston marathon that made her famous. 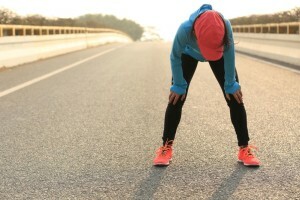 “The body does not want you to do this. As you run, it tells you to stop but the mind must be strong. You always go too far for your body. You must handle the pain with strategy…It is not age; it is not diet. It is the will to succeed.” – Jacqueline Gareau. 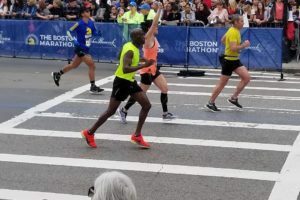 The marathon is often looked upon as the real test of distance runners and the Boston marathon is the world’s longest running marathon and a coveted title. In what seemed the heyday of running in the 1980s, just after the boom in the 70s, Canada had a female world contender on the international marathon circuit. Being too young to have seen her run I, but being a geeky young kid with a bowl-cut blonde haircut and a need to read about any Canadian runner, came across the story of Jacqueline Gareau. Jacqueline Gareau competing in 2010. Jacqueline, born in L’Annonciation, Que., is most-well known for winning the Boston Marathon on April 21, 1980, but unfortunately not without some controversy. Gareau led the women’s field for most of the race, only to find another runner, Rosie Ruiz, wearing victor’s laurels when she crossed the finish line. Ruiz was later disqualified after it was determined that she cheated, and Gareau was awarded the victory in a special ceremony one week later. Jacqueline’s official time for the 1980 marathon, 2:34:28, was recognized as a course record. Between 1978 to 1990 Jacqueline competed at an international level winning many marathons, finished fifth at the 1983 World Track and Field Championships and was on the 1984 Canadian Olympic team in Los Angeles. Jacqueline Gareau was the Canadian marathon record-holder from 1979 to 1984, with a time of 2:29:37 and held Canadian records from the 10k to half-marathon. In 1991, Jacqueline Gareau was inducted into the Canadian Road Running Hall of Fame and several years later was named Canadian marathoner of the 20th century. Ranking way up on the list of Canadian running greats, with Johnny Miles, Tom Longboat, Jerome Drayton and others I was honoured to get the chance to ask Jacqueline a few questions. With the 2012 Boston marathon creeping up on the calendar it seemed an appropriate time to profile this great Canadian runner. What was your most memorable or special running moment for you? What do you think of the recent resurgence of Canadian marathoners like Reid Coolaset and Eric Gillis? What keeps you running and competing as a master? Any goals for 2012? With all the advances in training, clothing and shoes, it’s funny that many Canadian running records were set many years ago. I think that is why I like running, advances in many fields can help but it still hard work, sweat and muscle that propels a runner to PBs and records. Run on Jacqueline, you were and are inspiring. Jacqueline is a massage therapist in Quebec at “Jacqueline Gareau Massothérapeute” and still runs at an extremely high level and ranks high in the masters category whenever she toes the start line. What is your story? Feel free to email me. See you on the roads or in the blogosphere.